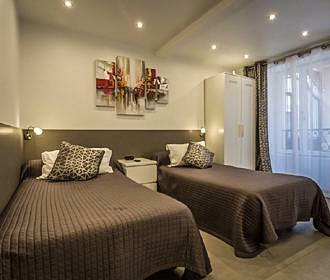 Located in the 11th Arrondissement within a building that was a fire station dating from the Second Empire, this is an Aparthotel classed as a 2 star residence hotel that has recently been renovated to provide apartments all located around a central courtyard with a kitchenette, fully equipped bathroom, free WiFi, etc. Having been in the same family for over 50 years, this building of this unusual hotel residence dates back to the reign of Napoleon III when it was a fire station and each apartment within the complex is either on the ground floor or first floor, some of them being duplexes. 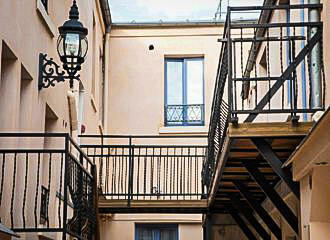 In an original Parisian style villa with a central paved courtyard, the Residence Hotel de l'Horlodge has a security gate entrance and video surveillance system along with a security guard at night, which makes you feel more secure while staying in a different country, whether it be for business or pleasure. There is a 24 hour reception with multilingual staff to help make your stay the best possible experience, although they do ask that you notify reception prior if you are not going to be arriving before 11pm. At reception you can obtain international newspapers, have the use of a hairdryer, iron and ironing board along with requesting fax and photocopying services. The Residence Hotel de l'Horlodge also offers a daily cleaning and maintenance service for short stays, or weekly for medium and long term stays, yet you can requested additional cleaning with an additional charge. 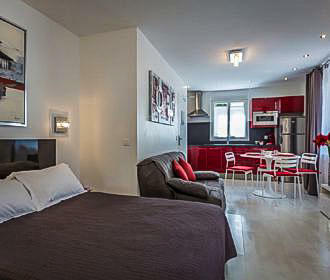 Although an equipped kitchenette is provided within the apartments, if you do not feel like prepping breakfast, then you can order breakfast from reception in the form of a room service French continental breakfast option for an additional cost of approximately €12 per person, which includes fresh orange juice, a hot drink, fresh bread, pastries, butter, jam, honey and yoghurt. When it comes to the accommodation at the Residence Hotel de l'Horlodge, there are single, double, duplex and deluxe apartments and studios available that will suit between one and four people, although we would like to point out that even though some of these are on the ground floor, they are not categorised as disabled friendly. However, each comes with a bathroom including shower, washbasin and toilet along with complimentary toiletries. There is also a LCD TV with satellite channels, a personal safety deposit box and free unlimited WiFi and WLAN internet access. The kitchenette includes a sink, fridge, hob, microwave, coffee machine and a kettle along with crockery, cutlery, cooking utensils, etc plus somewhere to sit and eat or relax, with some being larger than other, even with a breakfast come serving area depending upon the type of accommodation you choose. Located in the 11th Arrondissement the nearest Metro station to the Residence Hotel de l'Horlodge is the Rue Saint-Maur stop serving Line 3 or the Menilmontant stop serving Line 2, but a little further walk and you have the Couronnes stop also serving Line 2. However, the bus lines 96 and the Noctilien Night Bus Service via lines N12 and N23 will also get you within walking distance of the Residence Hotel de l'Horlodge.